Boulder Neighborhood Guide 2018 | Kearney Realty Co. I realized a few years ago that people coming from out of town were having a hard time characterizing the different neighborhoods within Boulder. 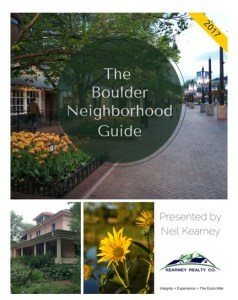 In response I created The Boulder Neighborhood Guide. In this report I have split Boulder into eleven different areas and present the lifestyle highlights, schools, shopping districts, local recreation and basic real estate statistics for each area. If you’re interested in learning more about the different neighborhoods within the City of Boulder this may be helpful.